This blue-staining mushroom is fairly easy to identify: look for the dark red cap with the red, deeply reticulated (net-like) stem. 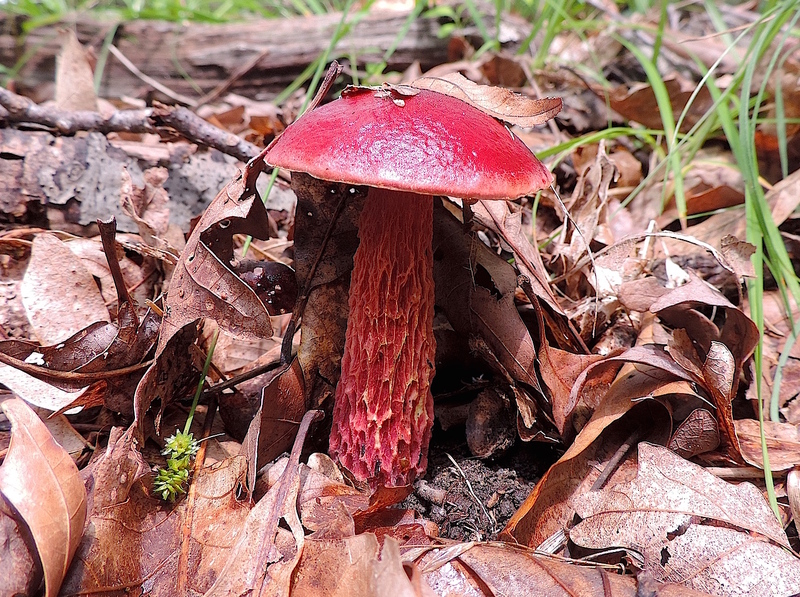 This photograph wouldn’t be rated too highly by fungal photographers because it doesn’t show the underside, though the pore surface is red, it contains tiny yellow droplets of liquid when young, and it lacks gills. So we have a red capped, red pored mushroom that stains blue. Maybe you’ve been told to stay away from these kinds of mushrooms, for some may be toxic. Well, that’s true. Some may be. This one, however, is generally considered edible (some individuals may experience gastrointestinal distress). It has a rather strong mushroomy taste with acidic undertones. Some liken it to citrus. I ate a few caps last night with eggs (yes, eggs for dinner) and enjoyed the experience. Look for them under hardwood trees, especially oaks… now through early autumn in Western Pennsylvania.